Every year, CONvergence has a theme which gets worked into the art and panel discussions and such, and for 2016 it was “And how do we get there?” So I decided to do an appropriate song. Connie and Mark 2 are some of the mascots of CONvergence, and I thought as space-age robots themselves, they might enjoy a little competition amongst the best in the universe. The poster Sarah and I created to advertise our show had a bunch of space-faring vessels racing, mostly because I wrote this song. 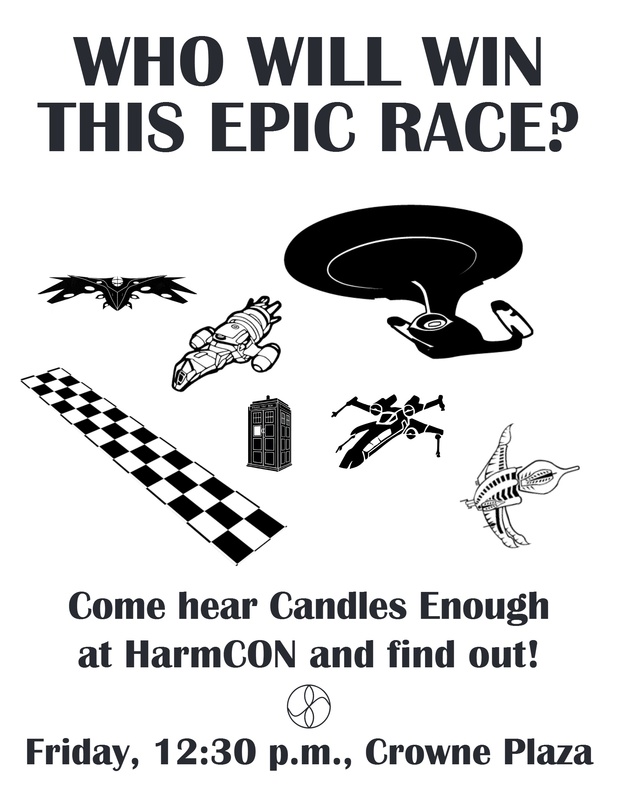 Funny story about the poster — the person who helped me with it placed the ships randomly. But she’d never seen Babylon 5, and didn’t know what the Minbari war cruiser was, nor how it worked (it’s the one in the bottom right of the image). So, originally, she put it on there backwards, turned the other way. This made me laugh SO HARD because it looked like the Minbari had taken one glance at this ridiculous space race and did the Minbari equivalent of “On second thought, let’s not go to Camelot. It is a silly place.” and left. Funny story about the song — yes, we reference the end of the movie Serenity. SPOILER ALERT: WASH DIES. It’s been 15 years, folks. But we still got somebody in the back yelling “Too soon!” at that verse. Oh well. We also got some serious groaning for our crack at The Doctor’s nose. I ALMOST put a joke on the end that the prize was “an extra hour in the ball pit.” Points if you know the reference!